1. Preheat the grill. Place the vinegar in a small pan with the shallot, mint sprigs and peppercorns. Season and bring to the boil then simmer until reduced by half. Remove from the heat and add a tablespoon of water. Strain the mixture onto the egg yolk, whisking all the time. 2. 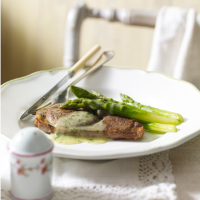 Grill the lamb steaks on both sides for 10–12 minutes until cooked through or to your liking. Leave to rest on warm serving plates while you finish the sauce. 3. Melt the butter in a small pan till bubbling. Place the egg yolk mixture in a blender or mini processor. With the motor running pour in the bubbling butter to make a thick sauce. Stir in the chopped mint and check seasoning. Serve with the lamb.